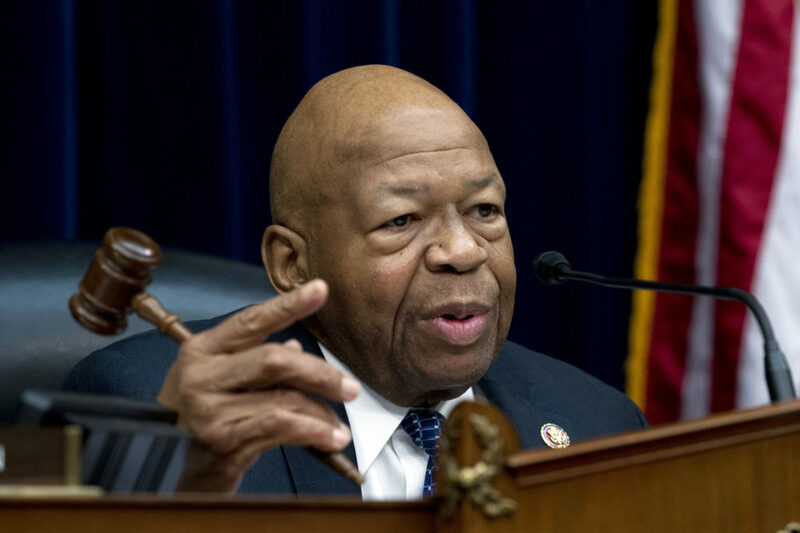 Rep. Elijah Cummings, D-Md., the chairman of the House Committee on Oversight and Reform, says Congress should both seek additional documentation and continue investigating the president outside of the scope of the Russia probe after the release of Attorney General William Barr’s four-page summary of the Mueller report. "I think that the president needs to slow down in his victory lap because he still faces quite a bit of hurdles with regard to answering for some of the things that he has done over the last two years," Cummings told On Point Monday. Special counsel Robert Mueller did not "establish" proof of coordination between the Trump campaign and the Russian government, according to Barr's summary. The special counsel also punted on the question of obstruction of justice. The president isn’t exonerated on obstruction, Barr conceded. But the attorney general decided not to pursue the matter further. Still, Cummings says Mueller's investigation was only "looking for criminal activity with regard to the whole Russian situation." He points to the other investigations the president still faces. There are still concerns surrounding his business dealings, his campaign and his actions as president, such as potential violations of the "emoluments clause." "There's quite a bit still hanging out there, and we still, again, don't know what this report says. Hopefully we will have not only that full report, but all of the documentation underlying the basis for the report," he said. Rep. Jerrold Nadler, D-N.Y., chairman of the House Judiciary Committee, says he will call on Barr to testify and make the entire Mueller report public. "The president has not been exonerated by the special counsel," Nadler said Sunday. "Yet the attorney general has decided not to go further or apparently to share those findings with the public. We cannot rely on what may be a hasty, partisan interpretation of the facts." When asked this weekend about the probe, Trump responded: "It began illegally. And hopefully somebody's going to look at the other side. This was an illegal takedown that failed." The special counsel’s investigation is over. Mueller won’t bring more indictments. It is a victory for the president. But federal investigations in other districts continue. And the political implications of the Mueller report are only beginning to unfold. Here's what else Rep. Cummings had to say to On Point. "It basically calls for us as a Congress to get all the documentation that is available so that we can look into this. Clearly, after 22 months of a Mueller investigation, millions upon millions of dollars spent, many witnesses interviewed, even Mr. Muller was not able to come to a conclusion with regard to obstruction. But at the same time, Mr. Barr, who of course was appointed by the president, comes — within 48 hours, reads the report, which we have not seen yet — comes to that conclusion." "Just the Cohen testimony before my committee revealed quite a few alleged crimes on the part of the president. Keep in mind — Mr. Cohen came into our committee with a check that had been signed by the president, and another one that had been signed by his son, with regard to payments to women that he had been involved with outside of his marriage. And keep in mind, there have been quite a few lies — 9,000 of them according to the Washington Post — over the last two years. And the question becomes, 'What? Why is that? What is that all about?' And I think we need to know it. We need to get to those kind of things and so we will get to the bottom. I promise you." "It is refreshing to know that we do not have the problem of the president being involved with the Russians and acting as their agent. But, at the same time, we have to keep in mind that it's a very high bar, it's a very high standard — and they were not going to indict the president no matter what." "It is good news that we don't have that kind of activity, but the problem is that we still have to make sure that we look into all of the other things that are involved here. As I said, there have been a number of issues that have come out, and I think that the press is not looking at those issues but just simply looking at this one thing — a very important thing, by the way — that the Mueller group has looked at. It is refreshing to know that we do not have the problem of the president being involved with the Russians and acting as their agent. But, at the same time, we have to keep in mind that it's a very high bar, it's a very high standard — and they were not going to indict the president no matter what. This administration wasn't going to indict him. "I can think of very few people in the country who would be facing the facts that the president has faced, with regard to the obstruction, that would not be indicted by now. Nobody is above the law, by the way. Not in this country." "I want them to reveal as much information as possible. Certainly, we do not want to see anything that would threaten our national security, and we don't want that exposed, because we want to protect our people. But I want to see the documents behind it. Keep in mind that after Hillary Clinton was exonerated, the Republicans went in — and I was an eyewitness to this — and they, within 48 hours — they had Mr. [James] Comey, who was FBI director, in and they asked for every document that he made his decision based upon, even the interviews by FBI agents. And they got them. And we were able to see unredacted copies, and then those same documents were exposed to the public. So why should it be different now? "Again, I believe in Mr. Mueller. I've said it all along. I've always believed him to be one of our most outstanding citizens and an outstanding lawyer. But the fact still remains that there are a lot of questions still open and we need to get to the bottom of all of it." "It all depends. One of the things that we're going to do is we're going to make sure we coordinate our efforts. Keep in mind, at least six committees are now looking at the whole Trump administration. So we will coordinate and figure out what is most effective and efficient. We will decide, the six of us, along with, of course, [House Speaker Nancy Pelosi], within the next week or so."